It’s all go at spoiltpig HQ at the moment, and perhaps most excitingly we’re thrilled to have teamed up with renowned food blogger Bintu Hardy who’s blog ‘Recipes from a Pantry’ is an award winning treasure trove of recipe ideas and family life insight. We’ve been working with Bintu for a while now and have created some mouthwatering recipes for you to try at home. Visit our recipes page to check out the latest additions to our range of recipes. They’re all tried and tested here at spoiltpig HQ, none last more than a few minutes and all are winners! 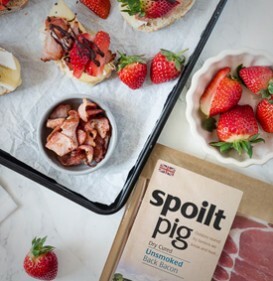 Check out what Bintu has to say about spoiltpig here and for the full stack of recipes just click here.Enjoy!